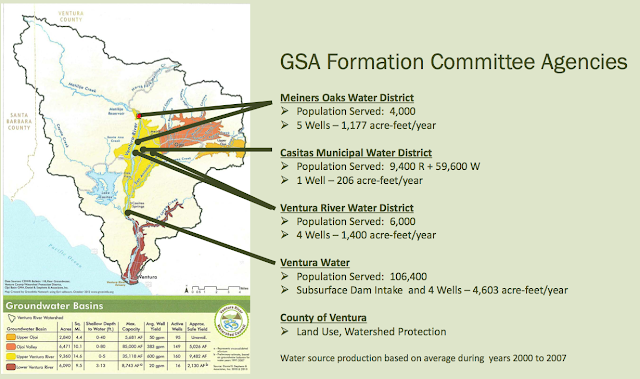 Formation of the "Upper Ventura River Groundwater Management Agency" began in 2015 in response to State legislation passed in response to the statewide water crisis. "California will no longer be the only Western state that does not manage its groundwater. The cost of doing nothing is the biggest economic gamble. Thousands of homes and small farms cannot keep pace with the race to drill deeper and deeper wells. The bills take a balanced approach - they protect property rights and incentivze local control." The legislation allows local agencies to tailor sustainable groundwater plans to their regional economic and environmental needs. This will be accomplished through the Groundwater Sustainability Agency (GSA) being formed by the local water districts.